Katy, a reader from Idaho who sent me this recipe several months ago, told me that she has had people insist that these meatballs are really made of meat. I must admit I was skeptical at first… but she’s right, these mock meatballs are incredible. They actually taste like “real” meatballs… the texture is the same… and they even look the same! Thank you, Katy… this recipe is definitely a keeper. The taste and texture is what “makes” these meatballs, so how the ingredients are prepared is extremely important. The walnuts must be ground very finely, almost to the “nut butter” stage. 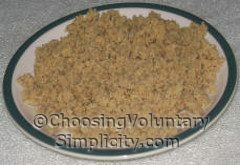 (The food processor does this in a couple of minutes.) Chopped walnuts won’t give the meatballs the right texture. 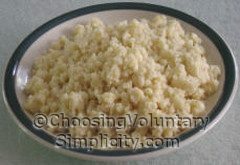 I grate the cheddar cheese separately in the food processor until it too is very finely grated. 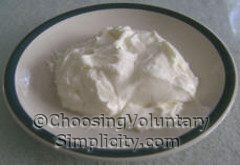 The yogurt cheese is made from my own yogurt, drained overnight in a colander (in the refrigerator). I chop the onion, cook it until it is transparent, and then run it through the food processor until it is pureed… this gives flavor but no chunks of onions in the meatballs. 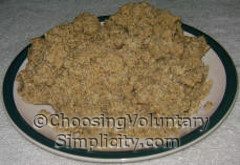 Combine all of the prepared ingredients… walnuts, cheddar cheese, yogurt cheese, onion, and herb-seasoned bread crumbs… in a large bowl. Add the salt, basil, and sage, and mix well. At this point, before you add the egg, taste the mixture and add more herbs, salt, etc., to suit your taste. Next, add the eggs… one at a time… and mix them in thoroughly until all of the ingredients are evenly distributed. 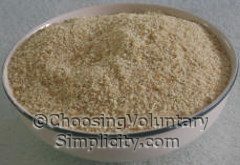 How many eggs to add depends on the size of the eggs and the dryness of the bread crumbs. 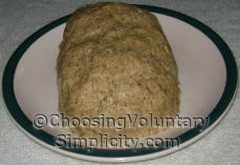 You will want the mixture to be the same consistency as for regular meatballs or meatloaf. Be careful not to add too many eggs and make the mixture too wet. I shape the mixture into meatballs that are slightly less than two inches in diameter. The original recipe then went on to bake the meatballs in tomato sauce for 35 to 40 minutes. I bake my meatballs in my homemade spaghetti sauce (tomatoes, basil, oregano, parsley, and garlic), but before I add the meatballs to the sauce, I bake the meatballs in the oven on a baking tray until the outsides of the meatballs are lightly browned. I think browning the meatballs adds to both the flavor and the texture, although this was not in the original recipe. This recipe is easily doubled or tripled, and the extra meatballs freeze beautifully in the sauce. my little carnivore (aka my son noah) is over my shoulder and commenting- ooh those look delicious! so i’m thinking i’ll be trying this recipe out myself, very soon! I love your recipes. I can’t wait to try this one. I’m trying to cut down on meat for ethical and health reasons. Ideas like this are a big help. They look delicious! Thanks for posting this recipe! It looks so good, especially in that last pic (in the sauce) . I have yet to find a good veg meatball recipe that I’m happy with (and that my kids will eat), so I can’t wait to try it. We made these and thought they were wonderful! Thank you for sharing the recipe. I just finished making the mock meatballs . I was so surprised and please at how well they turn out. My husband and I both thought they looked and tasted like meat. If I did not know better, I would not have believed it! I appreciate you sharing this fabulous recipe. Thankyou! Wow! Wow! Wow! Wow! Wow! Wow! Wow! Great recipe. Used with a Persian dish so I substituted the basil and sage with cinnamon and garlic. On a scale from from 1 to 10: 1,111. These have been my family’s favorites for years and we are meat eaters too, but having pictures helped so much as my texture was too variable. Now I know why! Eating these as I type. They are so good, I had to let you know. 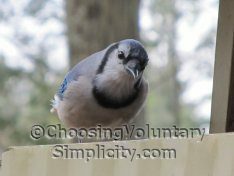 I’m vegetarian, and always on the prowl for meatless recipes. This one is a keeper! Thank you.